This SUV was not something I had previously considered, until I traded in my last SUV and I saw this there. After doing some research, and reading some great reviews, I decided to try it. And I'm glad I did. This is an amazing luxury SUV. I bought the premium I model, and it is full of most features you could ever want. 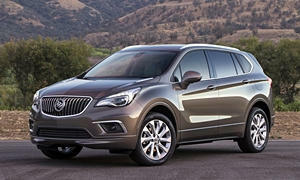 The exterior looks great, but does have the soon to be outdated Buick grille that has been around for many years now. The Buick logo has no colors in it, instead the insignia is just the design. The grille and logo will likely change to the new version in the next refresh. Inside the car is full of great features, is roomy enough, but not too big. Cargo area is big enough for a family of 4 with their luggage. Or a large dog. I had a GMC Terrain, and while it was considered to be bigger than this, it doesn't seem like it after owning both. The two color leather interior reminds me of a luxury vehicle I had tried that was an import, and frankly for the money, when on special sale, it is a great value. The features, layout, and comfort level are on par with any other luxury SUV, at a more affordable price. Performance with the 2.0 liter turbo engine is amazing. The transmission doesn't hunt for gears and is smooth as silk. Handling is great, and no issues to report. Safety items are decent, no auto brake on the premium I model, but does have an alert. The lane departure will the vehicle back into the lines, if you venture outside of the lines. Nav is a bit sketchy with its directions, but it works fine. I would highly recommend you consider this, vs. other luxury SUV's. If you watch for the sales, and it is a high percentage off of sticker, for certian models at certain times, you'll save a decent amount of money. I sometimes cannot believe I was able to buy this car, but with the big incentives, it brought it down to my budgeted amount. And it is by far the most luxurious car I've ever owned. In the same boat with a 2016 Buick Envision and a lease ending on a Terrain. The Buick is a tad smaller indlside but the handle doesn't compare to the Terrain. The Buick is quite athletic when you want it to or a quiet cruiser when you don't. Great ride quality plenty of pep of the 2.0T, great fit and finish in a cuv that is almost as good as my $70,000 cadillac XTS Vsport! We just compelted 1,000 miles round trip and thr Envision rode like a champ. The was pretty much lode to the roof and it dooled out 30 mpg at 65 mph. Pretty good a EPA highway rating of 26 mpg and AWD with 2.0T.